Everyone is born a shudra and by samskara one upgrades to dvija status. Is it the Bhagavata Purana that contains this verse? If not which scripture contains it? What was the context in which it was said? No this shloka is not from Shreemad Bhagvat Purana. This chapter is about adoration of Lord Vishnu is performed by means of Sixteen Upacharas. (Shodasopachara puja) (षोडशोपचार पूजा). This shloka is used in context of Achamana ,Yajnopavita , Dvija's. But the specific chapter talks about Devotion , Chatrumas puja and Panchyatana puja. 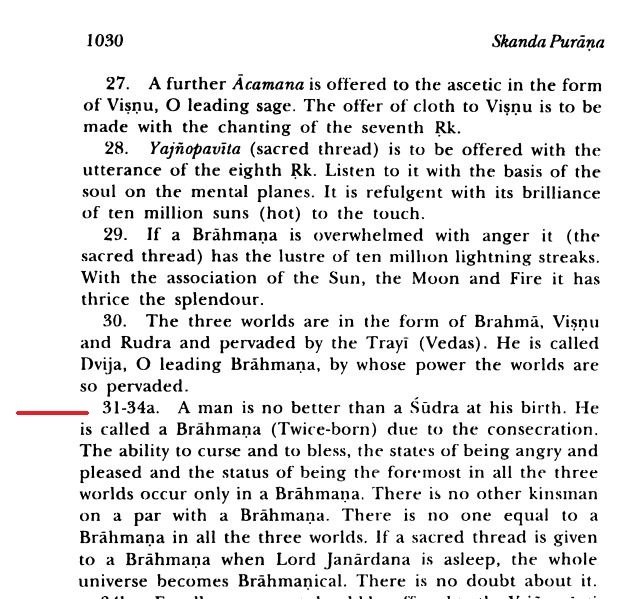 A Brahmin is compared with Shudra at his birth (just like a Shudra cannot able to learn Vedas throughout his entire life, a Brahmana also cannot learn until he undergoes Upanayana). Then after he completed his Upanayana, he becomes a dwija, that is Samskara Bhaved Uchhyate. So, this verse doesn't mean all humans are born Shudras. The full Verse as I read(Source not known exactly, but I think Manu Samhita). Buddha set this aside for vain ritual of casteism born from Vedic knowledge misunderstood by blind so called Kaliyuga duplicate Brahmin and said " By deeds one become brahmana." Hence everyone should have faith in heart for Truth and become Brahman (cutting tie of birth n death) is the message behind the statement. Not the answer you're looking for? Browse other questions tagged scripture puranas shloka varna shudra .